This detailed, 90-minute health analysis is one of the most crucial steps toward total health. We will record all the essential data about your head, neck, and oral health. We also do a complete and careful examination, including a periodontal screening, x-rays, and oral cancer screening. All of this data will be recorded as a baseline for your health records and to help us create your personalized treatment plan. How is the analysis done and will it be painful? There is no pain at all. 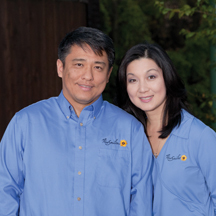 The entire data collection process is performed by our doctor and hygienist as a team. All our tests are passive in nature. The majority of the exam is done with the help of computer technologies. Can you explain the need for an analysis of this type for a potential patient? This examination is the equivalent of complete physical examination that you would get from your medical doctor. It provides a fuller picture of a person’s overall oral health. More importantly, this serves as an early detection mechanism for identifying problems that may not have symptoms, yet. Like any disease process, the earlier we catch them, the better results are. Why does AAS offer this type of analysis? At All About Smiles, our mission is to improve our clients’ oral health to the optimal level, not just to maintain status quo. In order to achieve our mission, we must know everything about our clients’ health status. We are very proud of this examination process. It represents years of training, experience and technologies in which we have invested. It is a living process. As new thinking and technologies become available, they will be incorporated into the process. Is it necessary to have this done to be a client of AAS? The short answer is no. We are passionate about what we do. We want the best for our clients. Comprehensive Analysis really represents the best that we can offer; so we strongly encourage our clients to go through this process. Of course, for those who decline the examination; for whatever reason, we certainly respect their wishes. It is our hope that given time and education, these clients would change their minds. What determines who has this done and at what age(s) should it be done? At the current time, we encourage all clients who are 18 or older to have it done. What are the primary things you are looking for and what does the information mean to the client? I try to reconcile the examination results with symptoms that clients reported. I am primarly looking for the oral-body connections. How does a patient make the best use of the information or determine the best course of action? At the end of the examination, we sit down with our clients to discuss the findings. The goal is to provide accurate information to our clients, so they can make educated decisions about their own health needs. Frequently, our clients discover that their source of dental problem(s) comes from the medical side of the equation, and vise versa. As a result, we routinely refer our clients to medical doctors and other allied health providers. How long is the information valid and does the client get a copy of the results? Currently, our policy is to perform this examination every five years. A copy of the results is always available to the clients. ← Previous Story Timing Is Everything, Even When Enjoying Your Favorite Foods.